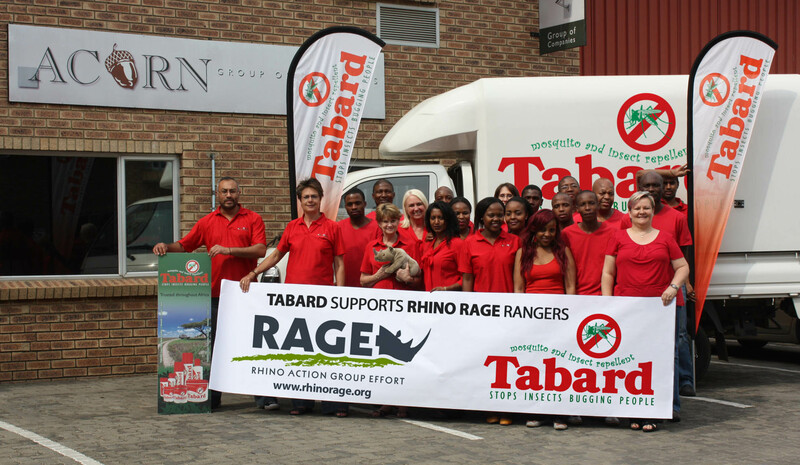 Prompted by their concern for the plight of our rhino population, Acorn Group, owners of the Tabard brand, recently donated large quantities of their products to help keep some 700 game rangers mosquito-free this summer. The donation was received by the Rhino Action Group Effort (RAGE) during October and distributed to rangers of the Kruger National Park, as well as rangers working on private reserves in Limpopo, Mpumalanga and North West provinces. Gail Downing, managing director of Acorn Group says she was informed by RAGE that rangers frequently use Tabard, mostly the aerosol spray, as it causes less discomfort when rangers are out in the field “where it's sweltering hot and baths are few and far between”. One of southern Africa's most trusted insect repellent brands, Tabard was introduced here during the 1960's and acquired by Acorn Group nearly 20 years ago. Since then Acorn has supported many worthy causes and initiatives, but this marks the first occasion the brand has become directly involved in the war on rhino poaching. Many members of the Acorn team are avid wildlife enthusiasts and supporters including Gail and her late husband Colin who was particularly insistent that the company should make contact with Rhino RAGE. The Tabard range includes the original stick as well as its aerosol and lotion - all of which provide personal insect repellent protection for up to 8 hours. In addition to its selection of citronella based insect repellent candles, the brand recently added Tabard Fabric Guard to its range. Sprayed on clothing and equipment rather than on skin, this product offers months of protection, wash after wash. RAGE, a LeadSA initiative, was set up to assist in the fight against the illegal rhino poaching scourge and was designed as a safe conduit for public contributions to the cause whether they be financial, material or in the form of skills and information.